Modern’s claim to fame is its diversity. I’m not alone in feeling like a notable portion of the format’s card pool is playable, and Wizards themselves push this narrative heavy-handedly. For many players, though, Modern is less about openness than it is about linearity. There are indeed plenty of options—so long as you’re not set on interacting with opponents. 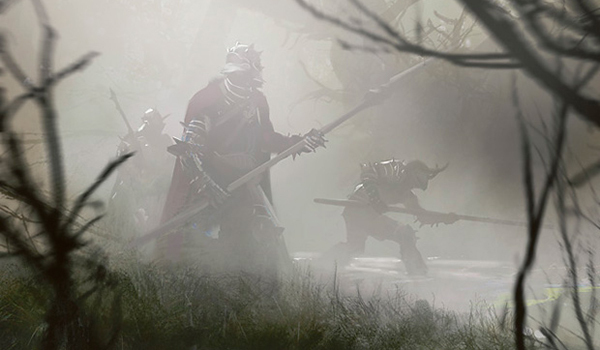 Learning to navigate the format’s hazy muskeg of linear decks might seem daunting at first, but with the right attitude, it can prove exciting and productive. In his article yesterday, Trevor correctly identified the upcoming GP Dallas as a guaranteed trend-setter for next year’s early format shifts. Until then, we have SCG Milwaukee to analyze. That tournament confirmed the feelings of many players frustrated with Modern’s linear bent, featuring a characteristically goldfishy Day 2 metagame breakdown and Top 16. This article explores how to defeat linear decks without giving up too many points against Modern’s diverse set of viable strategies. The most popular way to beat Modern’s linear decks is to simply play another linear deck. This method might sound silly, but according to the format’s numbers, it’s the one the majority of players prefer. Modern is a format structured around the Turn Four Rule—if a deck consistently wins before the fourth turn, makes up a large portion of the metagame, and is difficult for other decks to interact with effectively, Wizards will ban one of its components. But the presence of this rule doesn’t mean all linear decks aim to win on turn four. There are a couple benefits to piloting a linear deck that wins later. Dredge generally goldfishes victories around turns five or six. In exchange for this weakness, it bypasses the most common form of disruption in Modern: removal. Lightning Bolt, Terminate, and even Path to Exile look silly in the face of so many costless, recurring threats. Efficient kill spells like Bolt are the best way to interact with synergy-based linear aggro decks like Infect and Affinity. Blanking those spells gives Dredge a leg up against players hoping to stymie their own linear opponents with traditional removal. Another upside is longevity. RG Tron is renowned for its ability to steamroll midrange decks, which can’t keep up with the huge mana advantage amassed by an assembled trio of Urza lands. While a sequence of Inquisition of Kozilek, Abrupt Decay, Lightning Bolt, and Tarmogoyf is likely to dismantle many starts from Gruul Zoo, it won’t do much versus turn-three Karn into Wurmcoil Engine. Slower linear decks like Dredge and Tron have their strengths, but also a glaring weakness: faster linear decks can race them without issue. Neither deck has much of a plan against a souped-up, hexproof-ready Blighted Agent. It’s true that many linear matchups showcase two ships passing in the night. Since both decks are focused on their own proactive gameplans, neither has much interaction for the other, and the faster deck (or start) takes the game. But many linear decks in Modern boast incidental interaction. Take the Burn vs. Infect matchup. The most efficient way to interact with Infect is with Lightning Bolt effects, and the most efficient way to interact with Burn is with lifegain spells. Burn is already packed with Bolt effects, making it an easy favorite in this matchup. Not only is Infect devoid of lifegain in the main, it rarely has much in the side, falling back on a few copies of Kitchen Finks or Pulse of Murasa at best. In this matchup, Burn essentially gets to play three post-board games, temporarily granting it the same kind of advantage enjoyed by Affinity: an enormous game-one win percentage. An even more obvious example is RG Ponza vs. Tron. Of course the deck with mainboard Stone Rains will have a good time against the one looking to set up three specific lands. In this way, Ponza has plenty of incidental hate for the matchup. Getting paired with Tron isn’t something Ponza players can do by choice, though (or there would be a lot more of them). The skill in incidental interaction lies in predicting metagame trends. A player who brings Ponza to a tournament likely to be full of Tron will probably pick up some free wins during the event. Some players don’t want to play a linear deck. Others do want to play a linear deck, but can’t seem to beat a few other linear matchups. In these scenarios, hate cards provide an elegant solution to Modern’s form-shifting linear menace. These types of hosers provide a type of incidental interaction—they’re cards you’d run anyway because of their applicability in a wide range of matchups. The difference between incidental interaction and splashable hosers is the scale of the disruption they provide. Hosers can single-handedly shut down some linear opponents until they neutralize the disruption at hand, assuming they even have ways to. Examples include Thalia, Guardian of Thraben against Storm, Aven Mindcensor against Chord decks, Blood Moon against Bant Eldrazi, and Relic of Progenitus against Dredge. All four of these cards see mainboard play in certain Modern decks, and when they’re drawn against their respective linear targets, games tend to end quickly. Splashable hosers can fit into mainboards or sideboards, and while they boast utility against most of the field, they can decimate certain decks that focus on doing one specific thing very well (i.e. casting 20 instants and sorceries, filling the graveyard, etc.). One thing to remember about splashable hosers is that linear decks expect them. It’s not uncommon for Infect to run some number of Twisted Image or Viridian Corrupter in the mainboard to deal with Spellskite, for instance, or for Burn to pack Atarka’s Command or Skullcrack to get around a Lightning Helix. Sometimes, 2/1s with neat effects won’t cut it. Some linear decks pose such a threat to other strategies that those decks must prepare for the matchup with narrow, devastating answers. Examples include Stony Silence against Affinity, Feed the Clan against Burn, Rest in Peace against Dredge, and Fog against Infect. These cards frequently do nothing against other decks, but pull so much weight in their target matchups that players run them anyway. Packing a few specific hosers is a highly efficient way to shore up otherwise abysmal linear matchups—if your deck can’t be tweaked to win Games 2 and 3 fairly, just mulligan into a hoser and go from there. As with most domains, practice makes perfect. Putting in games is the best way to ensure victory against Modern’s many linear decks. One way to practice linear matchups is to switch decks with your testing partner. Reading a few Infect primers and articles by writers you respect about the deck will give you an idea of how it works, as will playing against it. But actually shuffling up Infect yourself gives you front-row access to the deck’s inner workings. Playing as the linear deck you want practice beating will reveal the deck’s weaknesses, showing you what the deck cannot deal with and how often it can execute its gameplan. Importantly, this method of practice will let you know the best time to cast your disruptive spells from across the table. Jamming post-board games should tell you how linear decks plan to respond to the answers you board in. Modern’s linear decks have a very good idea of what they’re doing, and they’re equally aware of the strongest disruption opponents have access to. An example: Ancient Grudge might be great for blowing up Ensnaring Bridge, but the Lantern Control player knows that, which is why they bring in Grafdigger’s Cage. Chalice of the Void might cut him off most of his spells, but assuming he has a Lantern on the field, he can still dig through his deck for Abrupt Decay. Being aware of these counter-attacks allows players to gauge how much time they have before opponents wriggle out of any soft-locks and make sure they apply pressure accordingly. Clock plus disruption has always been the key to cleanly defeating linear decks in Magic. Midrange decks employ this strategy with slower cards, giving them extra points against fair decks. But tempo decks take the principle to its logical extreme, playing the most versatile interaction available—permission—alongside a given format’s blue-chip efficient beaters. Barring the Treasure Cruise fiasco, Delver of Secrets strategies haven’t seen success in Modern since the printing of Abrupt Decay and Deathrite Shaman, which solidified Jund as a top format contender. But as Modern becomes more linear, even Jund is proving a little slow for the new onslaught of aggressive turn-four decks. The result is that there couldn’t be a better time for the Human Insect’s return. Ryan Overturf suggested Grixis Delver’s positive positioning earlier this week, and I feel similarly about Temur Delver—with Bant Eldrazi on the decline, and linear aggro rising in stock, Disrupting Shoal is starting to look ridiculous again. Whatever your preferred color combination, things are looking up for the little blue Nacatl that could. My sick fantasy is that Wizards will stop banning all of Delver’s great matchups (Storm, Twin, Bloom… Infect?!) and start letting Modern players figure out how dope Spell Pierce is. No, you can’t really play a Sphinx’s Revelation deck in Modern right now. But as long as you have a strong proactive plan of your own, and either consistently win by turn four or understand how to attack the format’s linear decks, you can play pretty much anything else. My final piece of advice is not to let a turn-two cheese from Grishoalbrand get you down. Just trust in your beloved Lightning Bolts and never stop learning! I’ve always loved to play interactive decks, especially in modern. I played death and taxes for a while and had some success when my meta was all about resolving ad nauseam and other non-sense, but eventually people shifted to more fair strategies, including lots of eldrazis, and i wasn’t winning anymore… Until i built spirits! Really the perfect deck for me, it has the right balance of interaction (very tempo oriented) and a solid beatdown plan (i turn 4 sometimes and steals wins, although not consistently). I don’t think the format is that hostile to interaction, jund and abzan are still fine choices. You just need to back it up with a solid proactive plan (goyf/grim flayer in jund/abzan, nahiri in jeskai, flyers in spirits, etc). As long as you are actively doing something to win before the opponent, sky is the limit!